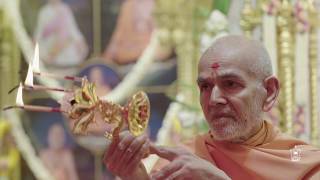 Following the Diwali celebrations on 19 October 2017, the Hindu New Year was devoutly welcomed in the presence of Mahant Swami Maharaj on Friday 20 October 2017 at BAPS Shri Swaminarayan Mandir, London. The first ceremony commenced at 5.00am followed by prayers for world peace and well-being. 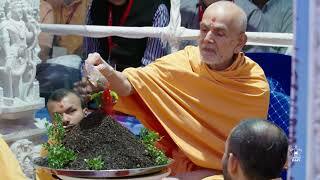 Children, youths, elders and swamis sang special prayers during Swamishri’s puja, befitting the New Year occasion. The ceremonial rajbhog arti followed at midday, first in the mandir’s upper sanctum and then in the Haveli assembly hall where an annakut – literally, ‘mountain of food’ – was artistically arranged as an offering of the first meal of the New Year in thanksgiving to God and to seek his blessings for the year ahead. Also joining the celebrations was His Excellency Yashvardhan Kumar Sinha, High Commissioner of India to the United Kingdom. Mr Sinha addressed the assembly and recognised the devotional offerings that were arranged by swamis and devotees, and congratulated the local community for getting together for the occasion. 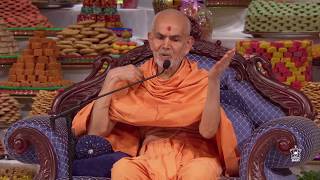 Swamishri blessed worshippers in the morning and encouraged everyone to imbibe the values of unity and strengthen their faith in God. 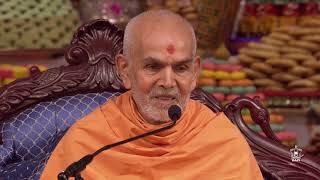 He also prayed for peace, harmony and righteous prosperity to prevail throughout the world and paid tribute to the unity of devotees and worshippers in their preparations for the celebrations.